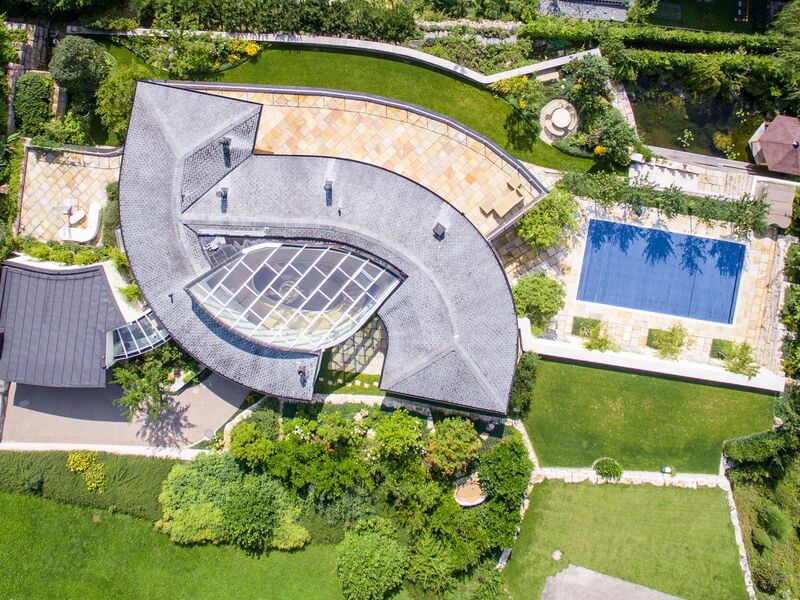 This beautiful property is located on the sunny south-western slope of the Uetliburg and offers breathtaking panoramic views over the picturesque landscape and of Lake Zurich. All rooms have separate control heating, lighting, cooling as well as ventilation and Sonos hi-fi equipment. The well-tended lawns, vegetable patch and fruit trees add to the diversity of the land and complement the pond, charming pavilion and Italian stone grotto. The property is suitable for families, but also individuals and couples who want to combine living and working under the same roof. Uetliburg offers an attractive tax rate and has all the amenities of a affluent rural community including: an old village center, bakeries, butchers, a bank, a supermarket, farmers shops and a primary and secondary school. The untouched landscape at the Ricken is very inviting for relaxing walks by the water or in the dense forests. Within 10 minutes you can reach tennis courts, inline skating parks, ski slopes or the Obersee (Lake). For further shopping and restaurant opportunities, you can reach the historic old town of Rapperswil-Jona within 20 minutes. The casino in Pfäffikon SZ and the Alpamare (water park) are also less than 20 minutes away. At the main entrance, a 9-meter-high atrium awaits you, decorated with a hand-forged iron railings and a wonderful corresponding wooden chandelier. 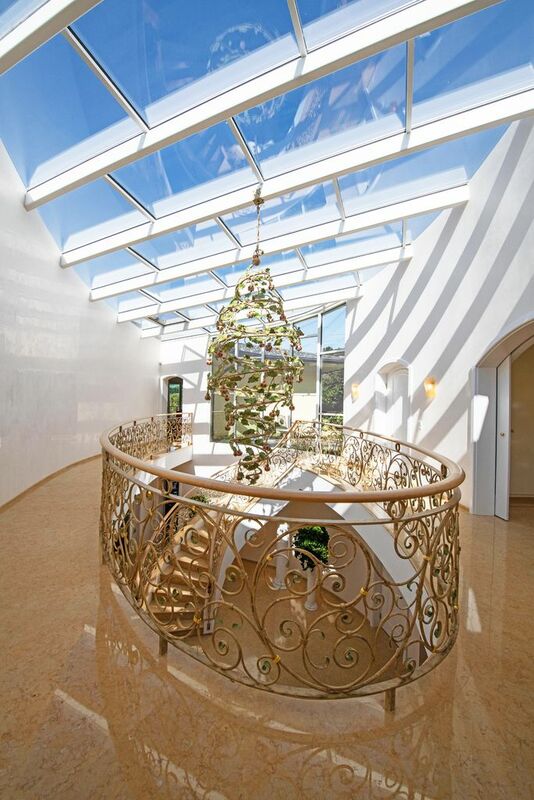 The Egyptian marble floor in combination with the "Stucco Veneziano" wall cladding and the atrium, floods the villa with natural light and gives the allusion of walking on clouds. 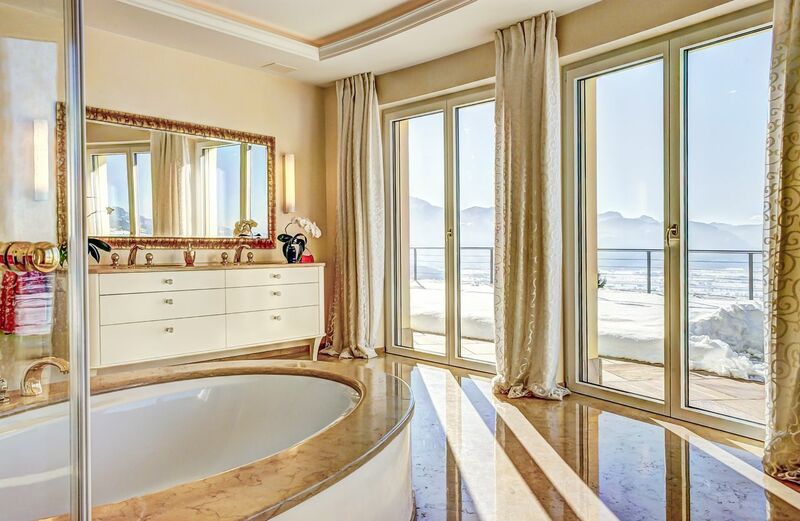 On the ground floor you will find the master bedroom with a walk-in wardrobe and master bathroom with a very large shower with waterfall effect, free-standing bathtub with a view of the landscape and Lake Zurich. A separate wing with bedroom, studio, office (conversion to bathroom possible) and separate toilet is ideal for home office or a guest apartment. 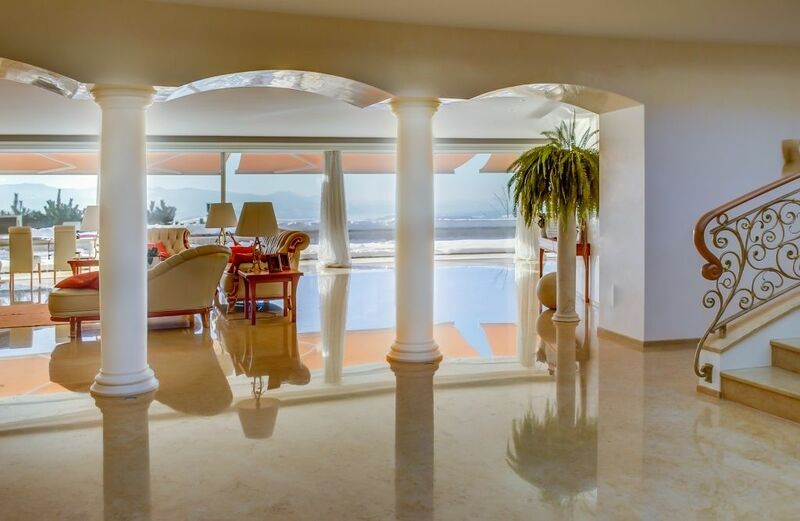 Almost all rooms have access to the 200 m² terrace, on which a beautiful Brazilian quartzite has been laid. 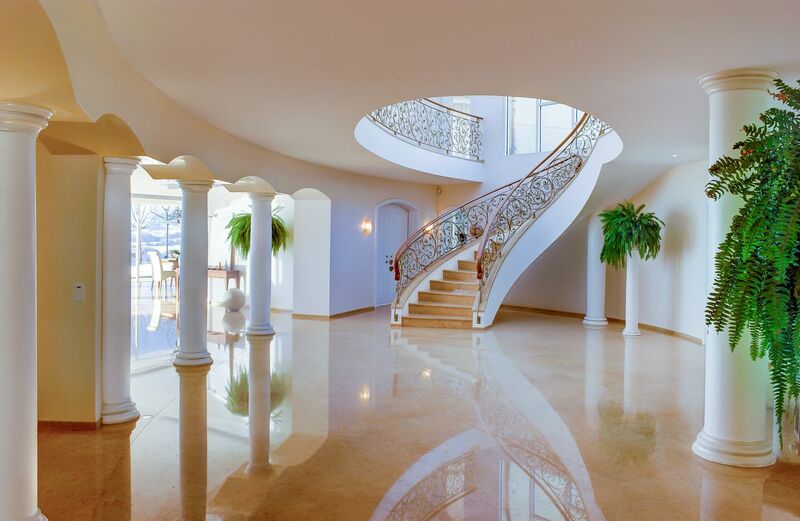 From the Sou Sol you continue along the marble staircase or the internal elevator. The left side of the building offers a fitness room with a wellness wing, which is equipped with an infrared cabin, a Finnish sauna, a steam room, a Jacuzzi and a bathroom with shower and toilet. A 400 m² large pool terrace with a saltwater pool (6 x 12 m long, 6 massage jets, counter-current (River-flow) system, and LED (underwater lighting) in the outdoor area complete this splendid wellness area. The kitchen has a cooking island, induction hob, steam oven, steam oven, warming drawer, refrigerator, freezer, two separate rinse zones, screen to control all house functions, intercom and external cameras. The surfaces were materialized with Brazilian Maccauba (gold). The dining and living area are kept open, equipped with a marble fireplace with sliding glass fronts and possibility for warm air production for cozy winter hours. The entire garden and sea side is fitted with floor-to-ceiling glass elements that open up to offer breathtaking views. 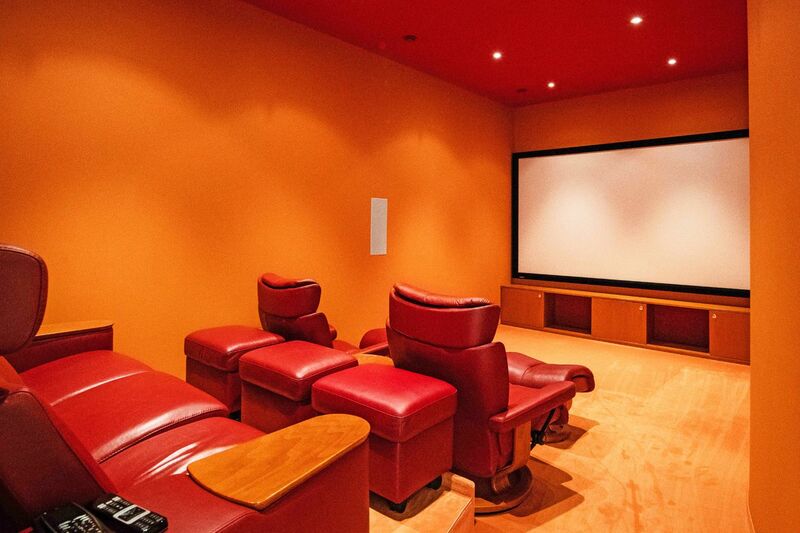 The Home Cinema is equipped with reclining armchairs, approx. 5 m² screen area, Dolby Surround Sound and 3D projector. A guest toilet and a lounge area for a pool table or a library complete the offer. The one bedroom in the Sou sol has a dressing room and a starry sky bathroom, a separate shower as well as a separate toilet. The second bedroom has an acoustic ceiling, as well as a bathroom, a separate shower and a separate toilet. 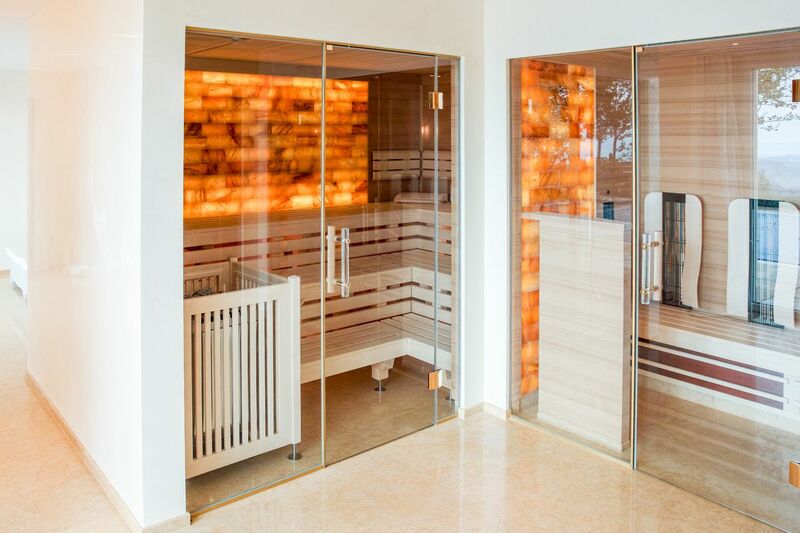 All rooms have individual control of heating, lighting, cooling and ventilation. If necessary, a wooden "Swedish" house can be purchased on the neighboring cell, which is well suited as a guest house or as an external apartment. 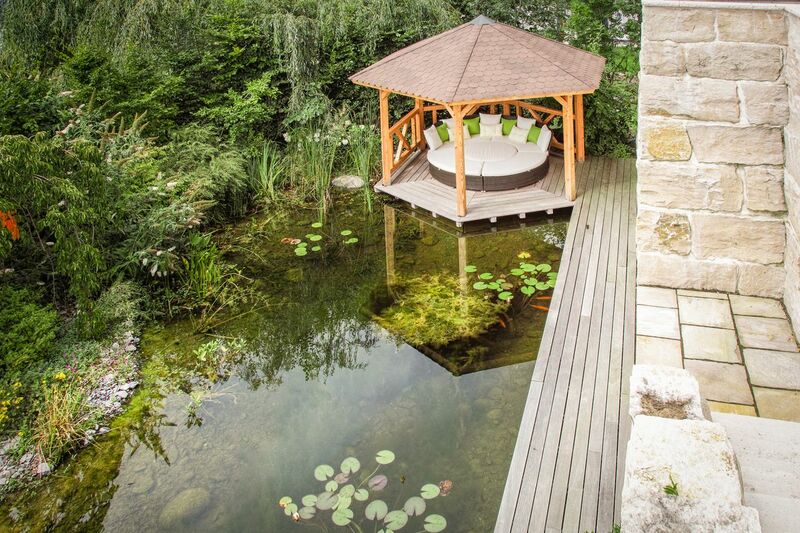 This beautiful property is located on a sunny western slope in Uetliburg and offers breathtaking panoramic views over the picturesque landscape and of Lake Zurich. The untouched landscape at the Ricken invites to relaxing walks by the water or in the dense forests. Within 10 minutes you can reach tennis courts, inline skating parks, ski slopes or the Obersee (Lake). For further shopping and restaurant visits you reach the historic old town Rapperswil-Jona within 20 minutes. The casino in Pfäffikon SZ and the Alpamare (water park) are also less than 20 minutes away. The municipality Gommiswald is located around 4 km east of Uznach am Ricken. Since the merger in 2013, the political community consists of the villages Ernetschwil, Gebertingen, Gommiswald, Ricken, Rieden and Uetliburg. Gommiswald is a beautiful residential area with a breathtaking views. With around 5,000 inhabitants, the community and location is very sought-after and has a high quality of life with a very good infrastructure. The original agricultural character has been complemented by upmarket commercial shops offering a wide range of goods & services for everyday needs. Gommiswald is fully developed and has excellent medical care and education facilities (kindergarten to high school). A trade school, a high school, two hospitals, easily accessible motorway access and long-distance railway stations are located in the neighbouring communities of Wattwil and Uznach. The community Gommiswald is embedded in a gentle landscape on the southern slope of the Ricken, high above the St. Gallen Linth area with a beautiful view of Lake Zurich, the Linthebene and the Glarus Alps. 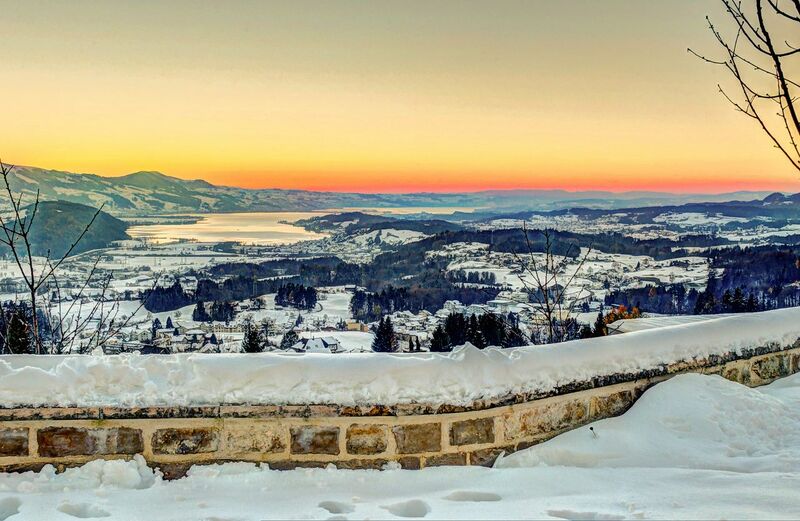 The proximity to the greater Zurich area is hugely appreciated by all of its inhabitants. Working in the economic center of Switzerland - while living in the recreational area. The property is accessible over a private road leading to a hand-forged iron gate which opens up to the garage with a generous space for two cars. A glass covered, heated corridor with additionally heated shoe cabinets and quartzite floor leads from the garage into the villa. In the main entrance area, a 9-meter-high atrium awaits, decorated with a hand-forged iron railings and a matching chandelier. The Egyptian marble floor in combination with the "Stucco Veneziano" wall cladding and the 9 meter high atrium, floods the villa with natural light and gives the allusion of walking on clouds. Uetliburg offers an attractive tax rate and has all the amenities of a affluent rural community including: an old village center, bakeries, butchers, a bank, a supermarket, various farm shops and a primary and secondary school. The closest bus stop "Uetliburg SG, Ottenhofen" is an 8-minute walk away. The 632 bus will take you to the Uznach train station within 9 minutes, from where you can reach Rapperswil-Jona in 12 minutes. The motorway access to the N17 is an 8-minute drive away. Zurich Airport and the city of Zurich can be reached by private transport within 60 minutes and Rapperswil-Jona within 20 minutes. The residential community Gommiswald offers a balanced population structure with an active village life. The numerous associations can testify to this. Whether youth activities, sports or music - the leisure and cultural offer at the Ricken is extremely versatile. The community supports and promotes the coming together of all its residents. Gommiswald thrills with landscape diversity in every season. As a natural recreational area, the Ricken offers a very nice hiking and biking trails. The cultivated Alps with large forest areas make it the sport and leisure paradise of the area. On the Ricken, cross-country ski trails on the pass, the ski lift at the "Bildhus" and a toboggan run invite for a fun day in the snow. Gommiswald is very proud of its outdoor swimming pool, located in the most beautiful of surroundings, and is a place where young and old can refresh themselves in the pure spring with drinking quality.